If you wish to contribute to Drupal Watchdog, please review our Submission Guidelines and then email your ideas to edit@drupalwatchdog.com. We are accepting proposals for issue #14 (7.01) which will be available in March 2017 and distributed at DrupalCon Baltimore. At this point we are only looking for PROPOSALS, which are a 1-2 paragraph summary of what you have in mind. The editorial theme for this issue is “The Business of Drupal”. This includes any and all themes related to doing business with Drupal. Drupal Watchdog invites contributions that explore this topic from a range of perspectives. In addition, we are always interested in articles that cover any of the aspects of working with Drupal, including development, project management, business cases, Drupal Community, etc. 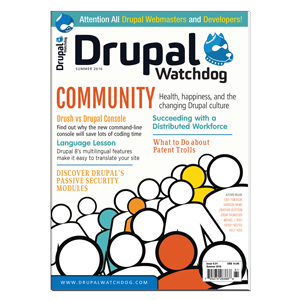 The deadline for contributing to this issue of Drupal Watchdog is February 23rd. Note that we are moving away from the strict definitions of article types and length used in the past. We are interested in any article idea that is relevant to the Drupal community, regardless of its length. We will be happy to discuss the scope and length of your article idea with you to develop the best possible solution for publication. The amount we will pay for your submission depends on the quality of your writing and supporting materials, the relevance of the content, the final length of the article, and the timeliness of your submission. We do not guarantee to purchase all articles submitted. If we do decide to purchase an article, we will ask you to sign an author agreement that specifies that we are purchasing all rights to the content. When you submit an article, you agree to not submit the article anywhere else unless 1) you explicitly notify us in writing that you have withdrawn your proposal and you then receive a written (emailed) confirmation from Drupal Watchdog freeing you from this contract, or 2) we reject your article for inclusion in this magazine. We are only unable to approve requests for withdrawing articles if they are already scheduled for publication. All images / tables / diagrams / photos / etc must be provided in TIFF or PNG format. They must be print quality, at least 300 pixels per inch. Better quality images give us more options when doing the magazine layout, so provide the best quality possible (within a 10MB per file limit).